build IT is the makerspace of the SDSU Library. 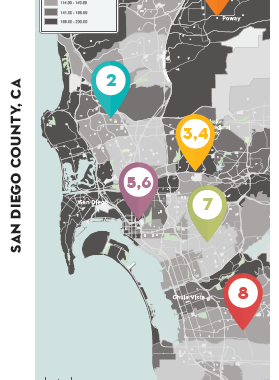 While it’s purpose is to provide access to technology to students, faculty, and staff, it has helped create opportunities to promote STEM in the San Diego Region. As the librarian, I led the development of various outreach events. However, I make sure to involve SDSU students in every event. Their involvement can vary from co-developing instruction to manning the exhibit table. While the focus is on giving back to the community, the goal of these events is to increase the learning opportunities for SDSU students. Below is a sample from 2015 – 2017. Description: Created an interactive display for teens to explore robotics through active play and learn about FIRST Robotics from local high schoolers. The mentors of the HS Robotics Club are SDSU students. Description: Discussed with STEM educators the benefits of a makerspace on education and share how college students learn through making at the build IT makerspace. Also, this was a networking event for librarians to connect with local maker educators. Description: Taught 3D printing where the kids were able to keep a 3D printed part. Some kids 3D modeled a part that was later 3D printed. SDSU students assisted with developing and teaching the curriculum. Description: Participated in the SDSU open house where local community members can learn about the campus. This event is marketed to potential students to explore and learn about SDSU. Description: Tabled during the San Diego-wide maker faire to promote the student work for the build IT makerspace and network with other makers in the community. Description: Taught 3D printing and 3D scanning by demonstration of creating 3D scans of people and allowing them to keep the export file to print. bracelet that each girl got to paint and take home. * This was a partnership between The O'Farrell Charter School, the SDSU Mesa Program, and the build IT makerspace. For the event, students were brought to San Diego State University. Description: As a reward for completing an after-school tech program, kids came to the build IT makerspace to explore and play with its vast collection of emerging technology. * This was a partnership between The Boys & Girls Club of South County and the build IT makerspace. For the event, students were brought to San Diego State University.